Chief Minister Pema Khandu today attended the Silver Jubilee Celebration of Calvary English School here at Moinhappa along with PWD Parliamentary Secretary Techi Kaso and were accorded a warm reception by Nyishi Baptist Church Council (NBCC) and the school management on their arrival. The Chief Minister unveiled the Silver Jubilee Celebration Gate erected to celebrate the 25 years of glorious service in the field of education by the school started in 5th February 1992 by the NBCC. He also unveiled the monolith erected to celebrate the school’s affiliation to CBSE accorded this year. The Chief Minister congratulated the school management and the NBCC for successful completion of its 25 years of service. He said the NBCC has made invaluable service to the people, having opened a school in those days when there were no proper road communications. “I understand the journey from 1992 to 2017 has been a very tough one for NBCC. The schools you have opened are running without any aid from the government. Whatever funds the school gets is through well wishers only,” said the Chief Minister. Appreciating the contribution of NBCC in moulding the students to become better human beings, the Chief Minister said that purpose of education should not only be to make a person literate but to make them better citizens. He said it’s better to be an illiterate and be innocent if being educated we cannot have a helping attitude towards our fellow human beings. 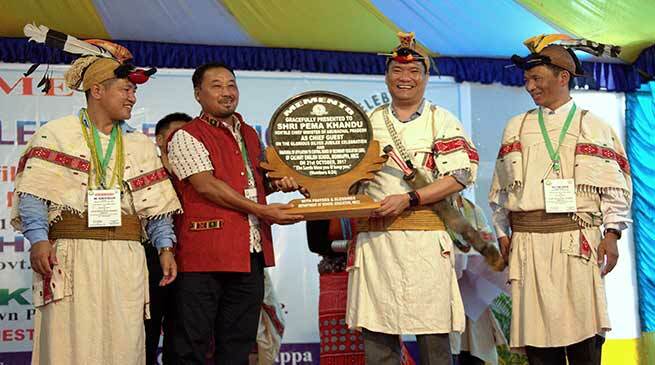 The Chief Minister Pema Khandu also lauded the Christian Missionaries of all denominations of having made immense contribution in the field of education. He appreciated the contribution made by Don Bosco Institute and called for active participation of private sectors in education. He said the government alone cannot fully address the educational needs of the people and stressed on the need to place greater reliance on private bodies. As support to the Christian Missionaries in their service towards the education, the Chief Minister announced a grant-in-aid of Rs 5 crore to be used for education uplifment of the state. He said the fund will be handed over to Arunachal Christian Forum (ACF) and the different Christian denominations working in education sector may avail the fund as per the need. Responding to the memorandum submitted by the school authority, the Chief Minister assured to fulfil all the grievances of the school saying that he is personally connected with the school as was his late father Dorjee Khandu. He promised to sanction funds in this financial year for construction of a laboratory, computer hall, library hall and water connection for the school. He directed the district administration to liaise with works department to immediately forward the DPR for water connection and appropriate proposals for construction of school annexe for sanctioning of funds. The Chief Minister informed that the state is trying to achieve its goal to be self reliant and not being dependent on the central government for funds. He informed that the tourism department in two years has increased its revenue from Rs 700 crore to Rs 900 crore. Earlier giving a brief history of the school, Principal Gollo Lyngto recalled the contribution made by former CM Dorjee Khandu who donated for the construction of the girls’ hostel. He thanked the present Chief Minister for fulfilling his promise for construction of a CC road towards school compound from Itanagar-Jote main road. The celebration was also attended by NBCC President John Panye, NBCC General Secretary Rev Tar Choya, Papumpare DC Tai Kaye, SP Tumme Ammo and other officials.